National Review has jettisoned another writer for associating himself with racism. Robert Weissberg, an occasional contributor to the magazine’s Phi Beta Cons blog, will no longer contribute, editor Rich Lowry has declared, because he “participated in an American Renaissance conference where he delivered a noxious talk about the future of white nationalism.” Whoops! This comes hard on the heels of John Derbyshire’s dismissal, also for racially offensive commentary. By the logic of newsmagazine trend-spotting, one more transgressor at National Review will give us a trend. But I’m not sure we really need one more. Ann Coulter was dismissed years ago for following up a column expressing religious intolerance toward Muslims with one making snarky reference to “swarthy males.” A decade before that, William F. Buckley fired the late Joe Sobran on grounds of anti-Semitism. Indeed, National Review has a laudable tradition, going back to its founding, of disassociating itself with racists (even though some of its own early editorial comment about race was fairly reprehensible). So, to some extent, does the right in general. 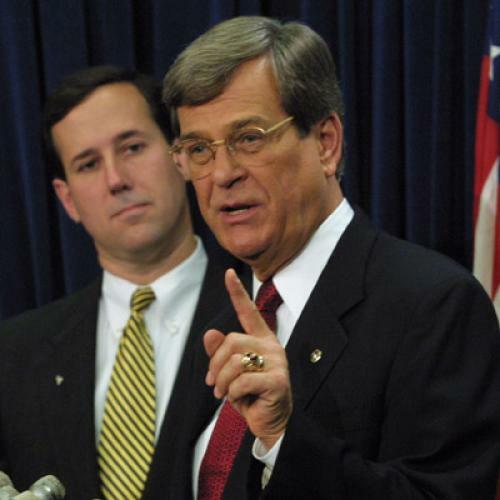 Remember when Sen. Trent Lott made his fatuous comment, in 2002, praising Sen. Strom Thurmond’s 1948 Dixiecrat campaign for president? He lost the Republican leadership over that. It wasn’t liberals who demanded he step down; we liberals were only too happy to see such an obviously unacceptable character retain a leadership position in the GOP. He was jettisoned by fellow Republicans, who were extremely sensitive to any accusation that the GOP was racist. The question is why this should be so frequently necessary. Conservatism isn’t an inherently racist belief system, and most conservatives are no more racist than most liberals are. But it is true that if you’re a racist you’re likely to gravitate toward conservatism, and toward the Republican party, for certain fairly obvious reasons. Its modern resurgence after the 1964 Civil Rights Bill (passed with more Republican support than Democratic, though opposed by that year’s Republican presidential nominee) was fueled by southern white migration from the Democratic party. The Republican party’s small-government philosophy has limited federal interference with discriminatory practices at the state and local level, and with racial bigotry generally. The Republican majority on the Supreme Court will likely soon abolish affirmative action altogether. Charles Murray, who two decades ago published a book arguing that blacks were intellectually inferior to whites, is beloved by conservative commentators (“Arguably the most consequential social scientist alive”—Jonah Goldberg) even as the larger social science community regards Murray as a crackpot. The Republican party’s tax policies favor rich “job creators,” who tend disproportionately to be white, and its opposition to the welfare state—initially to cash transfers, then to non-cash assistance like food stamps, and finally even to unemployment benefits—tends to harm lower-income people, who tend disproportionately to be black. The Republican party’s criminal justice policies have put an appallingly high proportion of black men in jail, often for petty drug offenses. Republicans tend to favor the death penalty, which leads to execution of a disproportionate number of blacks. Southern Republicans struggle to suppress a dewey-eyed sentimentality for the Confederacy, even though their party was founded in opposition to slavery, and even though its greatest leader, Abraham Lincoln, fought a war against Confederate secession. None of these affinities or policies is inherently racist. But taken together, they’re going to be a lot more attractive to racists than the liberal policies of the Democratic party. These facts are so well known that bringing them up is usually regarded as some sort of cheap shot akin to pointing out that a person with a prosthetic leg walks with a limp. But a one-legged person doesn’t have much choice in the matter. Can the same be said of the GOP? Dismissing the occasional racist is one way for conservatives to deal with their racism problem. Reconsidering aspects of their ideology that repel African Americans and other minorities and attract allies with toxic views on race would be another. But that won’t happen anytime soon. So expect the occasional purges to continue.